A new thesis paper by Kim K. et al. A western Eurasian male is found in 2000-year-old elite Xiongnu cemetery in Northeast Mongolia. Am J Phys Anthropol. 2010 Jul;142(3):429-40. doi: 10.1002/ajpa.21242., is helping to clarify the relationship between the Xiongnu, and prehistoric and modern Mongols, and to other ethnic groups, such as the Turks, Europeans, Han Chinese, Liaoning and Japanese Jomon and Ainu populations. Several indicators suggest the cemetery of Borkhan Tolgoi represented only a subset of the Xiongnu community, who appear to have been high-status individuals. These include low-burial frequency, funerary artifacts, elaborate practices, including the use of coffins and chests, and the depth of the graves (two to five meters). The genetic analysis performed by Keyser-Tracqui et al. (2003a, 2003b) found that the majority of the Xiongnu mtDNA sequences belong to predominately Asian haplogroups, however a few(11%) belong to predominately Europeans haplogroups. The DNA analyses [on three skeletons found in a 2,000-year-old Xiongnu elite cemetery in Duurlig Nars of Northeast Mongolia] revealed that one subject was an ancient male skeleton with maternal U2e1 and paternal R1a1 haplogroups. This is the first genetic evidence that a male of distinctive Indo-European lineages (R1a1) was present in the Xiongnu of Mongolia. This might indicate an Indo-European migration into Northeast Asia 2,000 years ago. 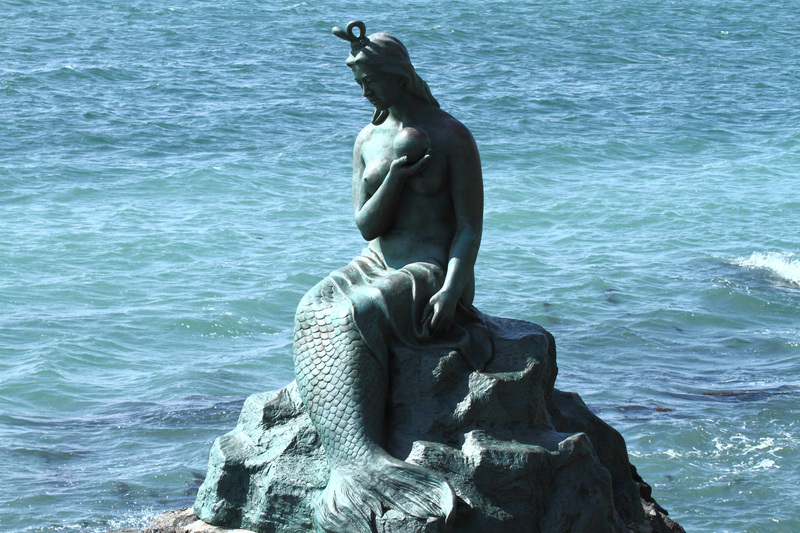 Other specimens are a female with mtDNA haplogroup D4 and a male with Y-SNP haplogroup C3 and mtDNA haplogroup D4. Those haplogroups are common in Northeast Asia (D4 is frequently detected across Japan, although C3 is found only among the Ainu). Egiin Gol cemetery features 219 skeletal material from 99 individuals buried from the third century B.C. to the second century A.D. The necropolis was arranged into three main sections that roughly correspond to temporal ordering as measured through AMS carbon-14 dating (Fig. 8.1). Section A is the oldest followed by Section B and Section C.
Section A contains a number of “double burials” near graves marked with higher status individuals. This practice was quite common among peoples of the Scytho-Siberian tradition, including the Sakka (Yakuts)and the Bronze Age Pazyryk culture of the Gorny Altai in southern Siberia (Chikisheva,2000; Ricaut et al., 2004a, 2004b; Amory et al., 2006). This practice has been reported in Murail et al. (2000) who investigated part of the Egiin Gol cemetery. Section C of the necropolis is interesting as it corresponds to the end of the cemetery’s use and may be associated with a Turkish influence of the Xiongnu tribe(Keyser-Tracqui et al., 2003a). Based on STR (short-tandem repeat) genetic markers(autosomal and Y chromosome) and mtDNA, Keyser-Tracqui et al. (2003a) found distinct signatures unique to this section of the necropolis. Specifically, they found markers of a Turkish origin and a characteristically kin grouping in Section C that would seem to indicate a demographic shift in the necropolis toward the end of the Xiongnu Empire. Clearly from the cluster analysis, the Egiin Gol individuals show an affinity with the small sample of Mongol Turk from the 8th century A.D.Ricaut et al. (2010) also detected this unique signature in Section C using nonmetric cranial traits. Bennett and Kaestle (2006) also investigated the cemetery using mtDNA and included a greater diversity of populations that may be representative of the individuals buried at Borkhan Tolgoi. Using pairwise genetic distance (FST) derived from mtDNA HVSI sequences to calculate between pairs of populations, these authors found the individuals buried in the Egiin Gol cemetery showed close affinity with other East Asians, including Chinese Han, Northeastern Chinese, Mongolian, and Japanese. This finding is similar to what Keyser-Tracqui et al. (2003) found using haplogroup data (89%of sequenced individuals belonged to Asian specific haplogroups) The analysis of 3D geometric morphometrictraits used in this dissertation also indicates a distinction among the Egiin Gol sample from the pooled Xiongnu sample. between the Xiongnu and modern Mongols … with Liaoning (0.108), the Eastern Han (0.128), and the Qinghai (0.129). (Other studies have shown the Japanese genetic affinity with all three groups as well), and therefore between the Xiongnu and East Asians including the Japanese (Using pairwise genetic distance (FST) derived from mtDNA HVSI sequences to calculate between pairs of populations, these authors found the individuals buried in the Egiin Gol cemetery showed close affinity with other East Asians, including Chinese Han, Northeastern Chinese, Mongolian, and Japanese). Between Xiongnu and Xinjiang Chinese samples based on FST values. 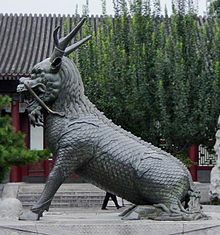 Therefore, although there may have been a component of the Xiongnu that were not entirely Mongol, there is a strong connection for at least some segment of the Xiongnu society. Note: The Liaoning sample dates from the second to third century AD. According to archaeological and historical evidence, the individuals buried at this cemetery might the descendants of the Donghu people, who, according to Chinese accounts, were a Mongolic nomadic people who occupied northeastern China and were conquered by the Xiongnu in 150 BC. These people were later broken into the Xianbei Empire, who have historic ties to the Xiongnu and modern Mongolian peoples (Di Cosmo, 2002). There is also a close relationship with samples from Qinghai, which span several periods, ranging from the Han through the Jin (265 – 420 CE). This area has also historically been a melting pot of peoples, having been home to the Xianbei, Turkic, Chinese Han, and Mongols. In the PC plots, the Xiongnu also group together with samples from the Eastern Han Empire (25 – 220 CE). This sample (Eastern Han) comes from several locations in Inner Mongolia … The affinity between the Xiongnu sample and the Qinghai, Liaoning, and the Eastern Han is also seen in the distance matrices (Mahalanobis and R-matrix). After the Mongol Period and modern Mongolian sample, the next closest D2 distances are the Though not shown,the R-matrix shows this observation as well, as all three of these samples are positive, indicating some level of gene flow among these groups. 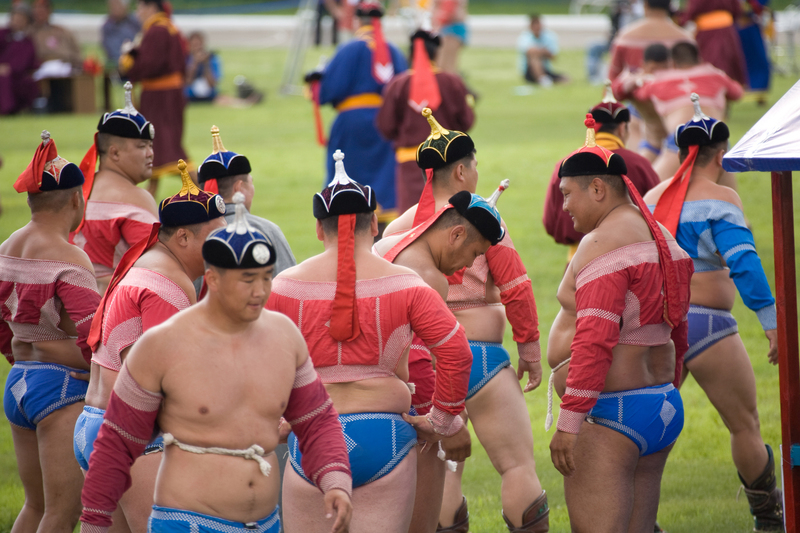 The Naadam Festival of Mongolia which centers around the three “men’s sports” of horse racing, wrestling and archery, practiced for centuries as intrinsic parts of nomadic life, is similar to the oft seen Japanese equivalents of horse racing, sumo-wrestling and archery displays during shrine festivals events, such as the annual yabusame archery event held at Kamakura‘s Tsurugaoka Hachiman-gu Temple. A small cloud of dust rising in the distance sparks fevered chatter from hundreds of herders pressed around a wooden bandstand on the verdant Mongolian prairie. Seconds later, dozens of small children on horseback, many of them under ten years old and most without helmets, thunder past the crowd, now whooping wildly. It’s almost a millennium since the descendents of Genghis Khan ruled an empire stretching as far as Europe, but Mongolians are still fiercely proud of their ancient nomadic culture, and the annual Naadam festival is where they show it most – and pass it on to the next generation. As the winning jockeys dismount, members of the audience jostle to scoop handfuls of sweat from the stocky Mongolian horses, wiping it on their own foreheads for good luck. “Naadam is a tradition passed down from our ancestors to our parents,” said Battulga Tsogbayar, a tiny 14-year-old boy who won Tuesday’s horse race near the town of Zuunmod, Tuv province. Naadam centers around the three “men’s sports” of horse racing, wrestling and archery, which have been practiced for centuries as intrinsic parts of nomadic life. Nearby, wrestlers in cloth underpants and jackets covering their arms and shoulders lumber into a small stadium, where, arms outstretched, they perform a slow, almost balletic dance to display their physical prowess. The winner of each tussle collects a handful of boortsog, a type of fried wheat, some of which he throws to the sky as an offering to nature before sharing the rest with his friends. Instead of gold, silver or bronze, the winner earns the rank of lion, while runners-up become elephants or hawks. “I’m Mongolian, so of course I started wrestling from childhood,” said Battungalag Chultempuntsag, an imposing figure with broad, slanting features and flattened ears who ranked as provincial elephant last year – the second-highest position. The national festival on Wednesday in Ulan Bator, the country’s heaving capital of over one million, hinted at the country’s future as well as its past. In a televised opening ceremony lead by the president, mass dances evoking shamanic ritual were followed by pop songs from the winners of the Mongolian equivalent of “American Idol” and a turn by the country’s Olympic athletes, as banners advertising Pepsi and electronics brands fluttered overhead. The wrestling and horse racing that followed have become big business, as the country’s fast-developing mining industry brings in huge amounts of money, and victorious horses can fetch hundreds of thousands of U.S. dollars. Mongolia’s economy grew at 16.7 percent year-on-year in the first quarter of 2012, according to the World Bank, mostly due to foreign investment in the vast mineral resources lying beneath the steppe. New opportunities are now tempting many of the country’s three million people towards Ulan Bator’s sprawling suburbs, far from the grasslands that fostered the sports of Naadam. “Young people are moving to the city and using traditional ways of life less and less, and this certainly has an effect on our national culture,” said S. Dulam, a professor of culture at the National University of Mongolia. As a result, festivals like Naadam have taken on a greater significance, he said. For Enkhbayar, a local artist watching the “Shagai” – a popular sport in which competitors flick part of a sheep’s ankle bone at a target also made of bone – the endurance of Naadam was a great comfort.